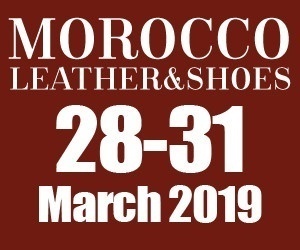 Morocco Leather&Shoes – 5th Morocco International Leather&Shoes Fair which will be held between 28 – 31 March 2019 at OFEC, La Foire Internationale de Casablanca. Worldwide visitors will discover the potential of Morocco market through Morocco Leather & Shoes fair. With the remarkable success of the last edition Morocco Leather & Shoes Fair 2019 will bring together around 200 exhibitors from 7 countries: Morocco, Turkey, India, China, Czech Republic and Egypt; also it is expected to have 11,000 trade visitors from Morocco and 25 foreign countries from West Africa, North Africa, the Middle East, the Gulf and Europe.